Datsun Redigo: Is It Ready to go against Alto & Kwid? The most terrific small hatch war ever seen...! Exterior design of Datsun Redigo and Maruti Alto clearly seems to be influenced by the styling note of the respective brands i.e. Nissan and Suzuki and is evident from the Japanese simplicity these vehicles manifest. Renault Kwid, on the other hand, has an aggressive look and seems to be more focused towards the Indian market. As seen from the above picture, the interior design of all these vehicles seems quite in line with the needs of the user. However, Renault Kwid is ahead of Redigo and Alto 800 in the matter of style and overall finish. All the three of our contestants are powered by a petrol engine of capacity nearly 800cc. In terms of power and torque output, Datsun Redigo and Renault Kwid are at par with each other while Maruti Alto 800 lags behind marginally. All these vehicles are equipped with 5 speed manual transmission. As far as fuel economy is concerned, Datsun Redigo and Renault Kwid again perform equally well (as claimed by the respective manufacturers) by delivering a fuel economy of 25.17 km/lit. However, Alto 800 yields a slightly lower mileage of 24.7 km/lit. Apart from the most basic safety feature of a seat-belt, all the three vehicles have the option of driver airbag. Due the cost constraints, other commonly used safety features such as ABS, passenger side airbag etc. are NOT provided on any of these vehicles even as options. However, surprisingly enough, Datsun Redigo comes with daytime running lamps. As seen in the price chart above, Datsun Redigo seems to be the most economical option. This is provided that the company sticks to the indicative price it has declared. At present, Datsun is accepting the pre-booking amount of only Rs. 5000. None the less, Maruti Alto 800 also has price-tag very closely to Redigo. 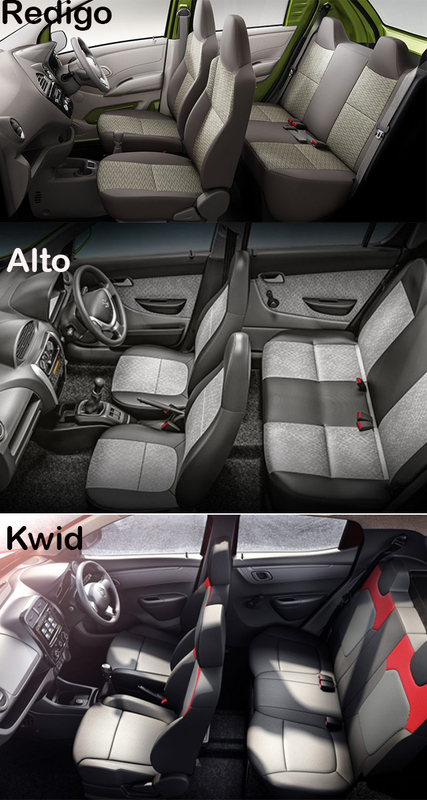 However, the Kwid seems to be the costliest option of the three. Thus, Datsun Redigo will have to push all its limits against the dashing character of Renault Kwid and the legacy of Maruti Alto! Home » Articles » Datsun Redigo: Is It Ready to go against Alto & Kwid?